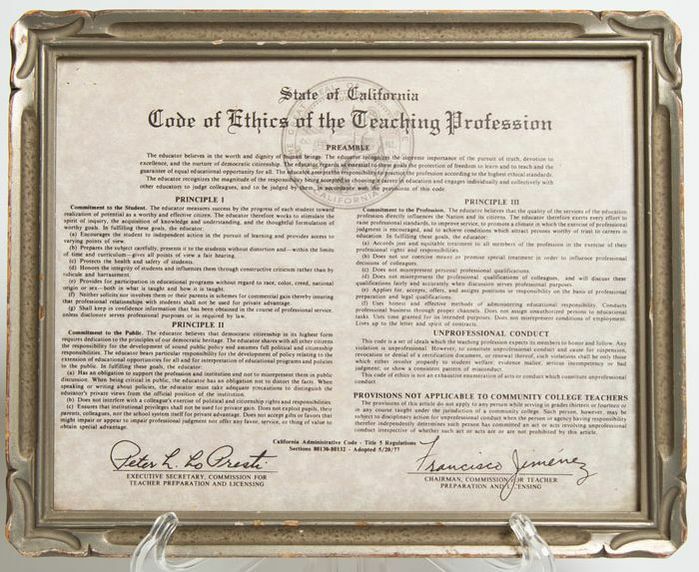 This official document presents the State of California Code of Ethics for the Teaching Profession. The document in our collection was adopted by the California Commission for Teacher Preparation and Licensing in 1977. It was handed out with the teaching credentials as a reminder for teachers to guide their day-to-day interactions with other people by its principles. Teachers no longer receive a Code of Ethics with their credentials. ​Many professionals serve the public and are expected to behave in ways that uphold certain ethical values—protecting their clients (students, patients) from harm (dishonesty, abuse, prejudice, incompetence) and guiding behaviors with the public and with colleagues. These are not methods for how to execute the job but rather emphasize how to act toward others while doing the job. This photo shows our document, but because the print is so small and dense, the key points are summarized below. ​The PREAMBLE stresses that the educator believes in the worth and dignity of human beings, recognizing the supreme importance of the pursuit of truth, devotion to excellence, and the nurture of democratic citizenship and protecting freedom to learn and teach and the guarantee of equal educational opportunity for all. PRINCIPLE ! emphasizes seven ways the educator encourages and protects the student. PRINCIPLE III explains commitment to the profession emphasizing honesty and responsibility. ​Finally, UNPROFESSIONAL CONDUCT would result in suspension or revocation of certification. It would involve jeopardy to student welfare, evident malice, serious incompetency or bad judgment, and/or show a consistent pattern of misconduct. Not all ethical behaviors are mandated by laws, and transgressions do not always bring about consequences. ​Guidelines and rules for teachers from the mid- to late 19th and early 20th centuries are plentiful. They were drawn up by school districts, towns, individual schools, local and state boards of education, and writers/editors of administrator’s and teacher’s journals. The journals note some related job advertisements and articles such as the benefits of only hiring single men or only hiring married women. The “behavior and ethics” were published in teacher contracts as guidelines or as rules that were used in hiring and firing teachers. Normal Schools in the Smithsonian collection has samples that would have been included in teacher training. There are several documents in the National Museum of American History Archives Center as well. An early set of “regulations” from Martha Flint’s Charity School Rules, Allesley (Coventry, England) may be only a behavior code for students. The earliest known American rules are dated 1799 from Braintree, Massachusetts, and discuss promoting virtue, piety, justice, humanity, and good order. ​This Code of Ethics document was donated by a retired teacher who received it in the 1970s along with her credential. Perhaps some teachers kept the document in a prominent place, but many undoubtedly filed it away with their credentials. Although the California Commission on Teacher Credentialing no longer sends out a Code of Ethics, the California Teachers Association does have a model code of ethics available online.